The first step in the treatment of this diverse group of conditions is making the proper diagnosis. Many, if not most of the patients we see in initial consultation have been misdiagnosed in the past. At the AVM Center of New York at Lenox Hill, our goal is to correctly diagnose and treat the unique medical problem that you or your loved one is facing. This term is commonly (and mistakenly) applied to all congenital vascular lesions, but it actually describes a very distinct condition which is confined to infancy and early childhood. This is the lesion seen in infants and sometimes referred to as a “strawberry birthmark.” It is quite common in the general population, occurring in up to 12% of infants. It is significantly more common in premature infants, females, and in the Caucasian population, and may be present at birth or appear shortly thereafter. It is a single lesion in most infants, but can be multiple on occasion. This is not a malformation but a benign tumor of the endothelial cells (the cells which normally form the walls of blood vessels). What makes these conditions unique is their characteristic progression through three distinct stages: appearance (at birth or shortly after), a “proliferative” stage when the hemangioma can grow quite rapidly (lasting weeks to months) and the “involution” stage (spontaneous fading of the bright red color, shrinkage and resolution), usually by the age of 7 or 8 years. Diagnostically, most hemangiomas have such a typical appearance and follow such a predictable chronological course that the diagnosis is easily made clinically and no further diagnostic testing is required. On occasion, a hemangioma located more deeply may appear as a soft tissue mass, which may require imaging studies (CT, MRI) or rarely a biopsy to confirm the diagnosis. While CT and MRI scans are ‘non-invasive” tests, they will generally require sedation or anesthesia in infants and children, so that their use is reserved for lesions which are of indeterminate nature clinically or when treatment is required. Vascular malformations are congenital abnormalities in which some part of the vascular system develops abnormally. These tend to be present from birth and in most cases do not run in families, so that they are considered congenital but not genetically transmitted. Usually these are isolated abnormalities in an otherwise normal individual. They may be found incidentally or cause symptoms ranging from mild discomfort to very severe medical complications. There are a large number of classification systems which are too complex for a nonprofessional to deal with, however there are certain specific categories which will be easily understood. When to treat a hemangioma is a controversial area, but most experts would agree that those hemangiomas which interfere with breathing, feeding, or visual development should undergo aggressive treatment. There are also hemangiomas which grow so rapidly during the proliferative stage that they can present with painful ulceration and bleeding, requiring intervention. On occasion, hemangiomas can occur in the liver, where they can be so large and have such high flow that they put a strain on the heart. Finally, there is a rare variant called Kaposiform Hemangioendothelioma (KHE), which tends to occur over the trunk, thigh, or shoulder, and has an unusual diffuse reddish or purple color with thickening of the skin, resembling an inflammatory process. This lesion has a tendency to consume platelets from the blood (part of the normal clotting mechanism), which can in turn lead to bleeding complications. If treatment is required for hemangiomas, it usually consists of local care (topical treatment) sometimes combined with systemic therapy. The mainstay of drug treatment for many years was oral steroids, which were effective but associated with a variety of side effects. A major breakthrough has been the use of the beta blocker drug Propranolol, a commonly used medication for cardiac conditions and high blood pressure in adults. It was recently discovered that this drug can dramatically accelerate the process of involution, used either as a topical cream or given orally. Studies have shown signs of shrinkage as early as the first month of treatment. This drug should be prescribed and monitored by specialists in the field. Port wine stains are a type of venous malformation involving the superficial layers of the skin, causing an area of pink to red discoloration. They may be seen at birth or appear in infancy and grow along with the child. Most are isolated lesions, but they can also be seen as part of other congenital vascular syndromes including KT Syndrome, Sturge Weber Syndrome, and Parkes Weber Syndrome. They are not the same as a hemangioma, which is actually a benign vascular tumor which tends to grow and then resolve spontaneously – a port wine stain has a tendency to darken over time and will not go away on its own. In some patients, the involved skin will become thicker over time, with a “cobblestone” texture. Most port wine stains are only of cosmetic significance but when the face is involved it can obviously become a serious problem for the patient. Depending on the size and location of the birthmark, treatments can include laser therapy or plastic surgical procedures. The type of laser used and the treatment technique are both critical to achieving an optimal long term result. True Arteriovenous Malformations (High Flow) In a true arteriovenous malformation (AVM), the arteries are abnormally connected directly to veins, in effect bypassing the normal capillary vessels. The effect of this “short circuit” can include a lack of blood flow to the normal tissues beyond the malformation, increased pressure in the draining veins, and in large lesions, a “high output state” which can cause an increase cardiac work load. It should be noted that the vast majority of AVMs are localized in one part of the body and can generally be dealt with using either minimally invasive or open surgical techniques. The most common procedure used to treat high flow AVMs is called embolization, in which a small catheter is passed through the circulation until it is in an artery feeding the malformation. The center of the malformation or nidus, is then closed using a variety of devices or agents which might include “glue” (a medical acrylic adhesive liquid), other liquid agents, microspheres, and other types of closure devices including vascular plugs and platinum coils. In some institutions absolute alcohol is also used as embolic agent to treat high flow AVMs. In an arteriovenous fistula, there is a direct connection between an artery and vein. This will result in extremely high flow and may cause both local and systemic cardiovascular effects. Most arteriovenous fistulas are actually acquired rather than being there from birth. They may be related to trauma, surgery, or other types of problems. There are a few unusual congenital vascular malformations which are like fistulas as far as being a simple connection between artery and vein. These would include pulmonary (lung) AVMs which are congenital but generally have very simple architecture. A carotid cavernous fistula also is congenital and represents a direct communication between artery and vein. In this type of anatomy, there is no nidus or network of smaller blood vessels between the artery and vein. Most arteriovenous fistulas are completely curable using either surgery or minimally invasive techniques such as embolization using platinum coils or self‐expanding vascular plugs. Once the direct connection between the artery and vein has been closed, there is little chance of new supplying vessels being recruited and very low risk of recurrence. This is unlike the more typical congenital high flow AVM, in which there may be numerous arterial feeders and a tendency for new feeding vessels to develop over time. Congenital venous malformations are usually made up of a spongy space in the soft tissues or muscles that fills with blood, usually after exertion or when the malformation is in a dependent position (due to gravity), often causing pain or pressure. At one time they were referred to as “cavernous hemangiomas,” but they are not true hemangiomas at all. They are nearly always isolated problems in otherwise healthy individuals. There is rarely any family history and they are not passed on to the offspring of affected individuals. Although they may not cause any symptoms until years later, they are thought to be present from birth. They are always benign and cannot turn into tumors, nor do they spread to new areas, although they may enlarge over time. Some patients with venous malformations may have associated an associated “syndrome”, meaning a specific group of signs and symptoms which tend to occur together, such as Klippel Trenaunay Syndrome (KTS). These are discussed separately under Venous Syndromes. When they are located in deep tissues, the individual may experience pain with no apparent external abnormality. If the malformation is large, it may present with a mass or swelling, especially in the extremities. There may or may not be an associated skin birthmark (“port wine stain”) as well as surface venous abnormalities. These malformations can be seen on ultrasound, but the exact size and extent is shown clearly on MRI scans, by far the best diagnostic test. One of the most common forms of venous malformation (despite its exotic-sounding name) is Klippel-Trenaunay Syndrome (KTS), which generally involves a single extremity (usually the leg, less commonly the arm) and includes over- or undergrowth of the involved limb, varicose veins, and a port wine stain (capillary venous malformation).. There can be a wide range of signs and symptoms, ranging from mild one-sided varicose veins and a barely visible birthmark, to unusual severe forms which can cause significant deformity and disability. Like most vascular malformations, this condition is congenital but not genetically transmitted, and is rarely seen in other family members. Some patients with mild symptoms will need only conservative measures, such as support stockings and elevation of the limb. Patients having more extensive conditions with swelling, pain, and cosmetically disfiguring malformations were formerly felt to have few treatment options, but this situation has changed over the past several years. Effective treatment is now available for many patients ranging from laser treatment for port wine stains to endovenous ablation, direct embolization or sclerotherapy of abnormal veins, and in some cases plastic surgical “debulking” procedures. In some children with significant limb length discrepancy, carefully timed fusion of the growth plate (epiphysis) at the knee is performed by specialized orthopedic surgeons in order to minimize the leg length difference when full growth is attained. It also used be thought that most or all patients with KT Syndrome had absent or abnormal deep veins, which would make treatment of the symptomatic veins inadvisable or even dangerous. Many medical and surgical texts still state that these conditions are untreatable and should be left alone. We have found that the vast majority of patients with KTS do have normal deep veins, allowing the symptomatic abnormal veins to be treated safely. Prior to treatment, the status of the deep venous system is documented by ultrasound, MRI, or contrast venography. An unusual variant of Klippel Trenaunay Syndrome is one in which there is an arterial component to the malformation; this is termed Parkes Weber Syndrome, and these patients may benefit from arterial embolization to reduce the pressure in the abnormal veins. Ultrasound and MRI studies will generally allow this diagnosis to be made accurately. The lymphatic system is more poorly understood than the arterial and venous systems. The lymphatic system consists of a fine network of tiny vessels throughout the body which collect fluid from the tissues and return it to the main circulation. The lymphatic system is also an integral part of the immune system, as it carries bacteria, viruses, and other foreign agents to the lymph nodes where antibodies are formed to fight infection. Malformations of the lymphatic system are most commonly seen in children, even in newborns. There are two general types – Macrocystic (large fluid filled cysts) and microcystic (numerous tiny cystic spaces infiltrating the soft tissues). They may present as a mass or may present with inflammation or infection. Lymphatic malformations are the only type of vascular malformation that have a tendency to develop infections, which may cause local inflammation as well as high fevers, in some cases requiring hospitalization for IV antibiotics. In some patients, lymphatic malformations are found in combination with venous malformations. The treatment of lymphatic malformations depends on the size and location of the lesion. Malformations involving the head and neck, especially in infants, may interfere with breathing, feeding, or visual development, in addition to their cosmetic appearance. Treatment usually involves surgery, drainage and sclerotherapy, or a combination of both. The most commonly used sclerosing agents for lymphatic malformations include Doxycycline, Bleomycin, STS foam, and a drug called OK 432 which is not currently used in the U.S. There are also some promising results being reported using a medication called Rapamycin (sirolimus), which is taken orally. 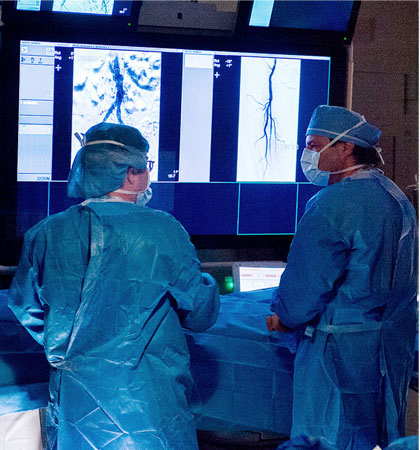 At the AVM Center of New York, we have internationally known experts in handling lymphatic malformations of all types – our team includes plastic and vascular surgeons, interventional radiologists, and pediatric and adult medical specialists who all specialize in the treatment of these malformations. The Information contained or referenced on the The AVM Center of New York at Lenox Hill website is for educational and communications purposes only. The site does not provide medical advice and should not be used as a substitute for professional help. The information is intended to support, not replace, the patient-physician relationship and the content is provided only as an educational resource. The website offers hyperlinks to other organizations and web pages and The AVM Center of New York at Lenox Hill is not responsible for information or advice contained on those sites. ©2015 The AVM Center of New York at Lenox Hill.